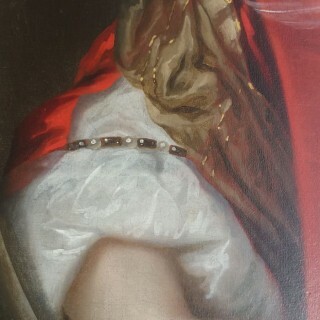 Portrait of a lady, half length, in a feigned oval wearing a ruby coloured dress holding twisted pearls across her bodice. 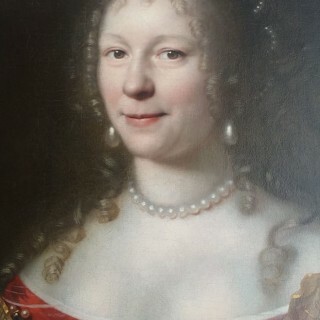 Signed ‘PNason’ and dated 1667 (lower right). Oil on canvas in a period giltwood frame. Pieter Nason (1612-c.1690) was a Dutch painter who lived and worked mainly in the Hague. It is believed he was a pupil of Jan Van Ravensteyn and became a member of the Guild of Painters of The Hague in 1639, being one of forty seven members who established the ‘Pictura Society’. 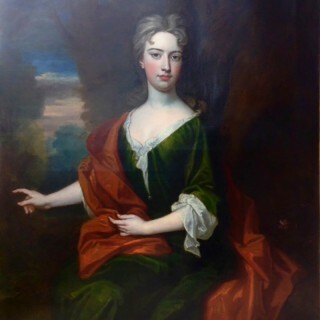 A portrait by him of the 1st Earl of Shaftesbury dated 1663 suggests a visit to England as well as a record by Lely`s executors of a payment to a ‘Mr Nason’ c.1680. Portraits by him painted in The Hague of Walter Strickland and Oliver St John can be found in the NPG, London and other examples of his work in The Hague, Amsterdam and Berlin, where he spent some time at the Electors Court. 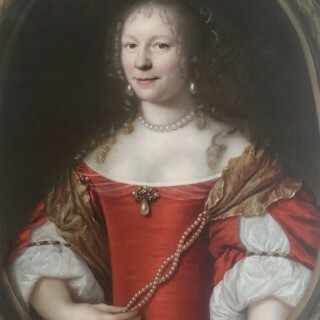 A portrait by the artist of another lady wearing a similar dress can by found in the Museum Boijmans Van Beuningen, Rotterdam.